Having enough dehumidification is one thing, but proper placement of dehumidifiers on the job is equally important. Start with plenty of airmovers to promote sufficient evaporation and circulation between the affected areas. Then place dehumidifiers where the most evaporation needs to happen – in other words, in the wettest places. If achieving proper circulation is a challenge (for example where there are structural barriers), use multiple dehumidifier-airmover sets to ensure even humidity control and reduce the occurrence of secondary damage. When using multiple dehumidifiers, space them evenly throughout the structure. The more moisture "capture zones" there are, the more effective the humidity control. Do not blow air directly into dehumidifier intakes. This can change the rate of airflow across the dehumidifier coils and reduce performance. 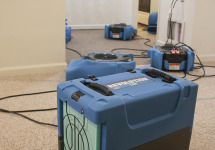 Place dehumidifiers near (but not blocking) an airmover's air outlet. This airflow helps to disperse the dehumidified air, increasing the dehumidifier effectiveness. Do not blow warm, dry air directly over finished, hard surfaces. This can cause them to over-dry and suffer damage. It is also critical to regularly evaluate humidity levels in the environment to ensure effective humidity control throughout the structure.